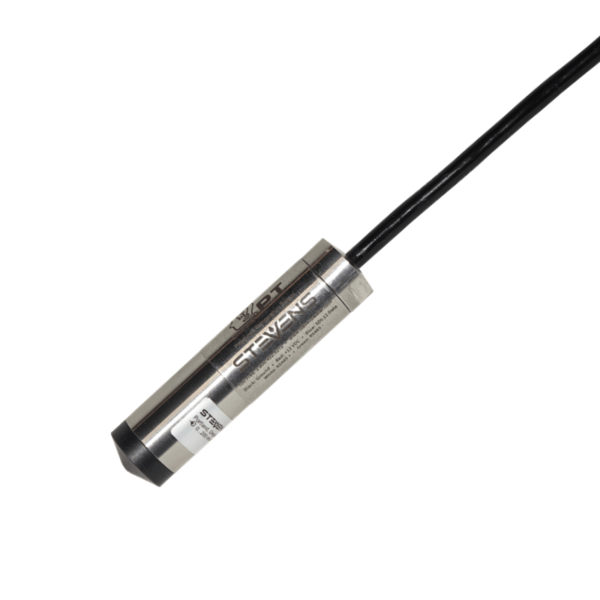 Stevens’ Smart PT is a ceramic membrane pressure and temperature sensor that delivers accurate results for a wide range of fluid level measurement applications. In addition to simple instantaneous measurements, this smart sensor features the ability to capture peak crest levels, and to automatically sample and report basic statistics on a configurable time interval. A corrosion-resistant stainless steel housing and potted electronics make Smart PT extremely durable and long lasting for submersible water applications. Smart PT is available with a vented or absolute pressure sensing module. Both versions come equipped with user specified length of cable. The vent tube provides an atmospheric reference which compensates for variations in barometric pressure. In addition to programmable corrections for local variations in Earth’s gravitational field, Smart PT also compensates automatically for the water temperature-density dependency. Every Smart PT provides both SDI-12 and RS-485 digital interfaces. Compatible with existing power and data logging instruments, the sensor can easily be deployed for data collection at remote monitoring sites. Average and standard deviation outputs on up to 3600 autosampled data points over configurable time window. Data is stored until requested using the M2 command. Crest gauge function automatically captures minimum and maximum level and number of seconds since the event. Smart autosampling can provide smoothing and oversampling. Environmental corrections for local gravitational field and changes in fluid density due to temperature. Output SDI-12 (Version 1.4) and RS-485. Selectable output: Pressure in bar, kPa, psi or water depth in m, cm, ft. Temperature in °C or °F. Weight Probe: 120 g (4.2 oz.). Cable: 40 g per m (0.4 oz. per ft.).